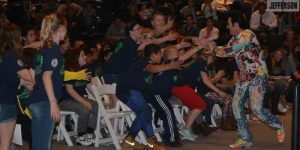 WARSAW — Retro Bill, lip-synching cops and a laser light spectacular all marked the end of this year’s DARE program as sixth-graders from nine area elementary schools gathered to celebrate their graduation. 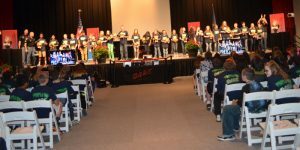 Students from Madison, Claypool, Sacred Heart, Leesburg, Harrison, Washington, Jefferson, Eisenhower and Lincoln, along with their families, teachers and DARE officers, packed the Manahan Orthopaedics Center at Grace College, Winona Lake, Tuesday evening, May 10. 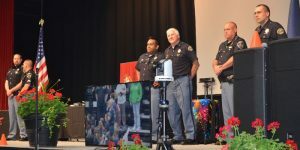 Festivities began with a presentation of the colors by the Fort Wayne Police Department Color Guard-Pipe and Drum Brigade. 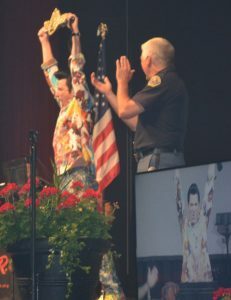 Detective Brad Kellar rode up to the stage on a police motorcycle, lights, sirens and all, then belted out the national anthem. 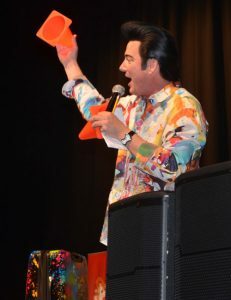 Kids leapt to their feet in excitement as keynote speaker Retro Bill, the official international DARE Buddy, made his way to the stage amidst cheers and high-fives. 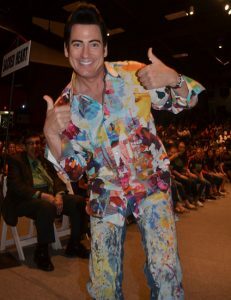 Retro Bill visited Warsaw Schools last fall, bringing his high-energy message of drug resistance and self-esteem. 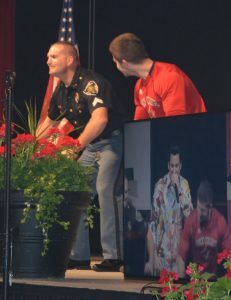 A lip sync contest ensued between DARE officers Doug Light and Joe Hawn, with Light coming out the winner. 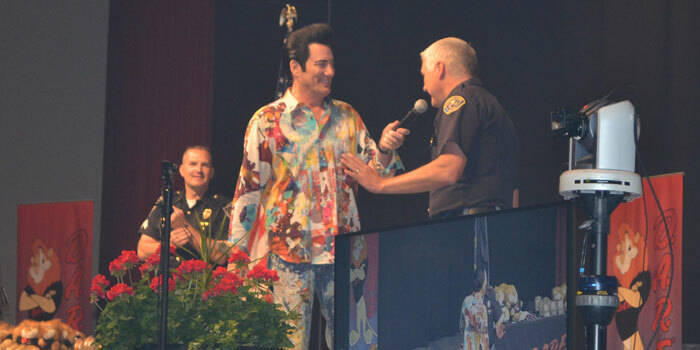 Hawn, Light and Retro Bill made a special presentation to Kosciusko County Prosecuting Attorney Dan Hampton, thinking the prosecutor’s office for sponsoring WCS’s DARE program. 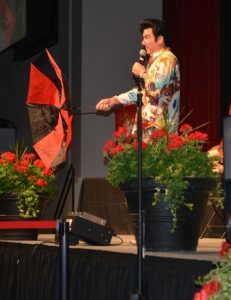 Retro Bill recapped his message from earlier this school year, using props like a remote control, an umbrella and a suitcase to drive home his message of not letting others decide one’s happiness. He also urged all students to write down their dreams and goals now and what they need to do to achieve them. He urged them to think big and not hold back. “If you’re a girl and you want to play in the NFL, be the first to do it,” he said. 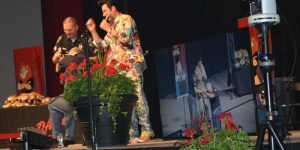 He also spoke about the dangers of both legal and illegal drugs, giving an example of an allergic reaction he had as a child to amoxicillin, when just one pill caused his throat to close and his fever to spike to 105 degrees, Fahrenheit. 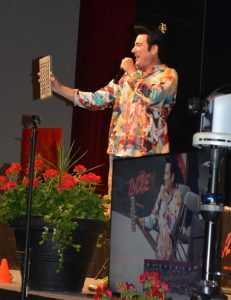 He also spoke on self-esteem, using a giant remote control to remind kids they can “mute” put-downs and negative talk and a suitcase to illustrate carrying a heavy burden. 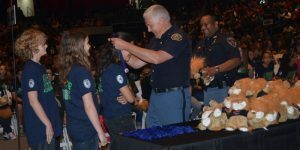 DARE grads also received recognition in several categories, including self-esteem, most stickers earned and the top 25 essays. The evening wrapped up with a laser light show. Retro Bill shows off the prize belt for the lip synch contest. Cpl. Doug Light and son flex for the audience. Retro Bill delivers a message on drug resistance and self-esteem. From left, Cpl. Doug Light, Kosciusko County Prosecuting Attorney Dan Hampton and Winona Lake Police Chief Joe Hawn. 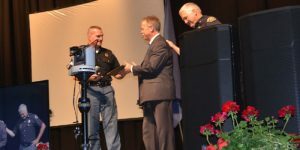 Hampton received special thanks for the prosecutor’s office being the major sponsor of Warsaw Schools’ DARE program. 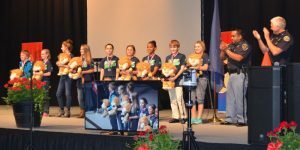 Self-esteem winners line up on stage. Kids enjoy the lip synch contest. Retro Bill mugs for the camera. Retro Bill uses an umbrella as an illustration tool. Cones marked different stages in life during Retro Bill’s keynote talk. Retro Bill invited all officers present out onto the stage for special recognition. 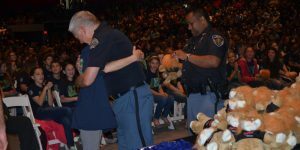 DARE Officer Joe Hawn handed out medals and hugs to DARE award winners. Students line up to receive their medals. DARE winners proudly show off their prizes.